In this edition of Cintar Connection we take a look at Pipe Codes and Pipe Stress Analysis. 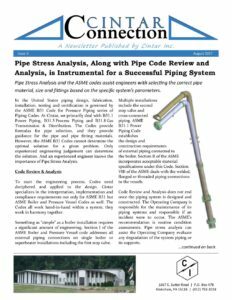 ASME Codes and pipe stress analysis are an integral aspect of piping design and maintenance. The Codes indicate materials and limits for the piping, and pipe stress analysis determines the actual forces acting on the piping. By knowing the analysis results and the Codes, the engineer can properly design and support the piping system. Click here to read about our Pipe Engineering capabilities.